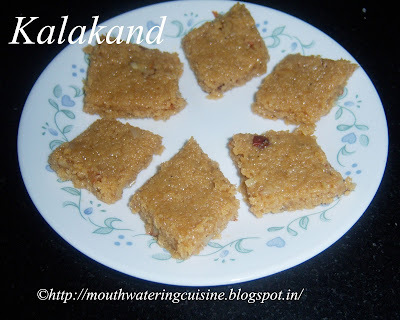 Kalakand or Indian Milk Cake or Milk Burfi is an Indian traditional sweet. It is the most scrumptious sweet in North and East India made during festive season. Making kalakand is very easy but time consuming. It is normally made with whole milk, but today I made it with regular milk only. As I was left with lots of milk at home, I thought of making best use of them. This is also very tasty. My mother is expert in this, every Thursday she used to make it to offer it to God Saibaba. Normally we get milky white texture but today I made it a little pinkish shade by adding sugar earlier. My mom told me a technique to get white or pink color. If sugar is added at the beginning, it looks pink upon completion, and white, if it's added at the end. So make your choice of colour too. I like it in pink, so I add it at the beginning only. Some people add paneer or condensed milk to make it faster. It helps in getting rich taste also. She never added anything like them. We need only three ingredients to make this, but need to have patience and time to make it. We must do this sweet in a thick bottomed vessel only. Take a thick bottomed vessel or a kadai or wok. Wash it thoroughly. Add little water in the bottom and pour milk over it. Adding water will save milk from burning. Allow this to boil on a high flame till it starts rolling boil. Turn the flame to low and allow it to boil. Mix it with a spatula, whenever a thin layer of cream forms on top of it. Allow this to boil till the milk solidified like khoya. This may take at least half an hour to 45 mins. Stirring occasionally. Once milk thickens to the desired amount, add almonds to the milk and mix it well. At this stage, towards the end of the milk solidifying, add sugar and stir vigorously. This will take another 5 to 10 mins. Spread ghee on a plate and immediately spread kalakand on it. Cut it in desired shapes. Let it cool for some time and then separate the pieces. 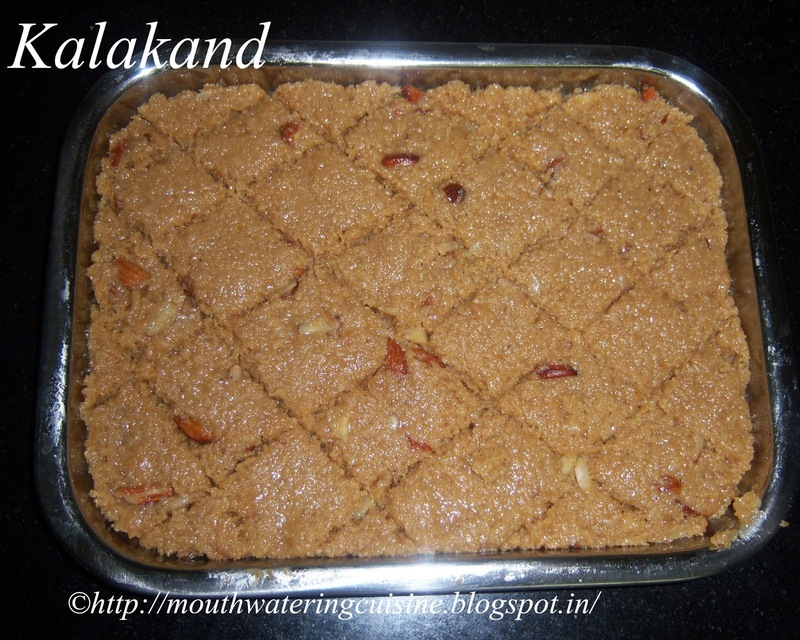 Serve kalakand any time.